The majority of the track-and-field team didn’t have to travel very far on Friday, April 21, for the University of Dubuque Invitational, hosted down the block. Teams in attendance included UD, Beloit, Cornell, Culver-Stockton, and Rockford. Despite gusty conditions, the athletes were not deterred, and many Duhawks performed very well. First-years Patrick Mikel and Alexis Alt both added their names to the Loras record book, with Alt’s vault of 3.05 meters in the pole vault placing her ninth all-time, and Mikel’s time of 21.94 in the men’s 200 placing him seventh all-time. Alt also had a stellar day in the 100 meter dash, qualifying for finals and running a season-best time of 12.59. She finished third in the race. Later, she ran again in the winning 4×100-meter relay. Alt, first-year Gabrielle Noland and seniors Alexis Hanson and Alyssa Simon won the relay with a time of 49.30. The 400-meter hurdles were exciting to watch on both the women’s and men’s sides. In the women’s race, Loras’ four hurdlers collected 23 points for the team with their high finishes. Junior Rachel Kilburg led the Duhawks, taking second with a time of 1:08.72. Close behind her was sophomore Taylor Schaefers, who ran a personal best of 1:08.98. Juniors Celia da Silva and Devin Hasson took fourth and fifth, respectively. On the men’s side, the top two spots were claimed by first-year Shamari Scott and senior Andrew O’Neill. Scott won the event with a time of 56.48, and O’Neill finished shortly after his teammate, running a personal best of 56.71. At the end of the day, both the women’s and men’s teams took away second-place finishes, coming in only a few points behind the University of Dubuque teams. “The wind made it challenging, but I feel like our team raced smart despite the conditions,” said Coach Bob Schultz of the less-than-ideal racing conditions for the runners. 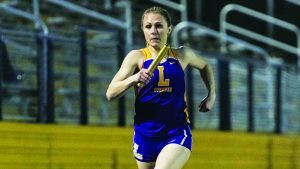 A few distance runners on the team attended the University of Dubuque meet, cheered on their teammates, and subsequently left, mid-meet, for the “Meet of Champions” hosted by Augustana College in Rock Island, IL, which took place on the same night. Four Duhawks competed in the men’s 10K race, including seniors Ben Hedges and Colin Ensminger, junior John Stoppelman, and first-year Ryan Murphy. Hedges and Murphy both competed this race for the first time in their running careers, and ran great times of 32:21.86 and 33:21.51, respectively. Ensminger, a seasoned pro at the 10,000 meters, ran a lifetime PR of 32:28.15. The four men competed very well despite the lateness of the race, which didn’t start until 9:40 p.m. under the stadium lights of the Lindberg Stadium. Each week, a few track- and-field athletes are honored as “Duhawks of the Week” if they excelled in their events the meet before. Ensminger was one of these select runners, thanks to his 10K performance on Friday night. Despite the fact that the race began pretty late at night, Ensminger and teammate Hedges executed their race plan together to take eleventh and ninth places, respectively. Next week, the Duhawks will split up again as six relay teams and five individuals travel to the Drake Relays, a prestigious three-day meet held in Drake Stadium in Des Moines. The rest of the team will travel to Simpson College in Indianola on Friday.